Free candy is the best tasting! Satisfy your sweet tooth by getting free candy samples. A number of websites offer free samples for various food and candy samples. These websites often list the sample with a link on where to get it. Many require filling out surveys or participating in multiple offers from partner companies, especially if the sample is a full-sized item. Read the terms and conditions carefully before partaking in these kinds of online sample deals. A few websites do offer candy samples with little to no effort on your own part. Wal-Mart's free samples usually require you to provide mailing information and answer a few easy questions. Check back frequently to find candy samples, as the products rotate weekly and monthly. Free Sample Forager offers samples with a short description of each sample and link to the sample page. You can search by tags, like "free samples," "free food," "sweets/desserts" and more for candy. Search through the food category at Totally Free Stuff!! to find candy samples. Read comments and check user ratings to learn about any potential problems with the samples. Sometimes you can obtain free candy samples in stores. Certain grocery stores may have "sample" days, where employees of either the store or brand come in and offer samples to customers while they shop. This is often done on a weekly or monthly basis, so ask employees to find out more. 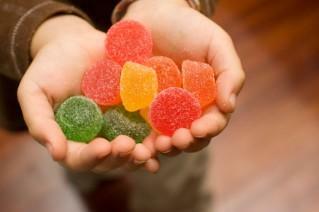 Candy stores may offer you the opportunity to sign up for their newsletter or e-mail program. This may result in samples being sent to you or coupons that make the candy free after rebate. Ask at your favorite store to find out. You can also make a point to check out a candy manufacturer's website when they introduce a new product. A free sample may be offered of the new candy to customers who want to try it before buying it. When you're traveling, check and see if any of your favorite candy manufacturers are in the area. Companies such as Jelly Belly in Fairfield, California (near Napa Valley) offer free factory tours with sweet samples for visitors. The Hershey factory in Hershey Pennsylvania offers a virtual tour with free samples at the end. For free chocolate on the West Coast, try the Scharffen Berger chocolate tour in Berkeley; reservations are required. Eating free candy samples is a way to get a bit of sugar without spending a lot of money. If you like a product that you got for free, write the company and let them know. They may send you more samples or money-saving coupons to use when you buy the product.